COMMITTED TO IMPROVING THE FINANCIAL HEALTH OF YOUR PRACTICE! Quality does not cost. It pays. Less denials. Less work. Lower Cost. Lets work smarter together. Validation & submission of electronic claims via EDI. 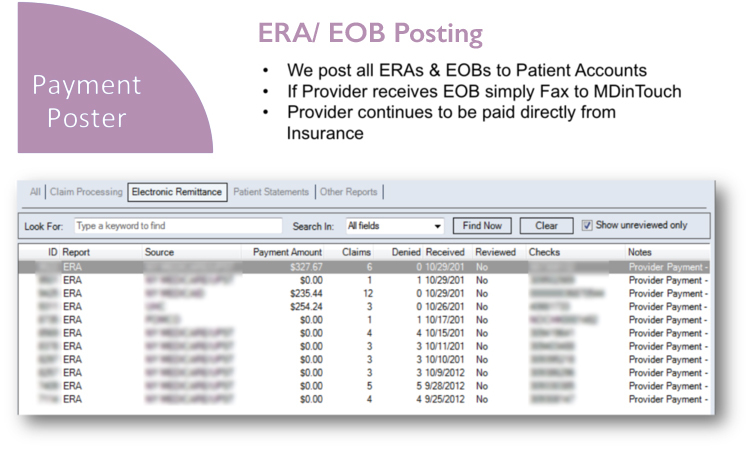 Post all your EOBs and ERAs to patient accounts. Fix and resubmit Rejections, Denials and No Response claims. Claims Tracking & Follow up with Insurance companies. Online A/R reporting software w/ Patient Eligibility support. FREE setup, implementation and training with no up front costs! The 3 P's: People. Process. Product. 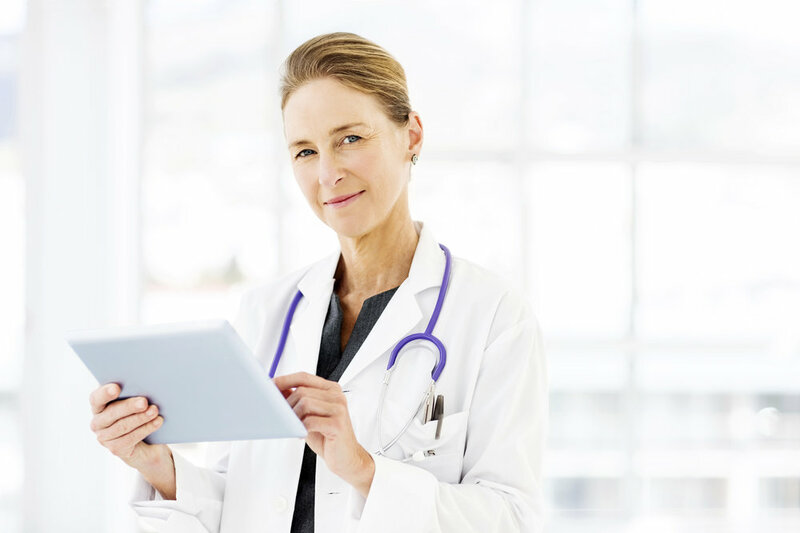 What is a medical billing service anyway? It comes down to great people, doing great work in well-structured processes. The MDinTouch service brings you a complete billing team, each a specialist in their part of the process and together execute complete and precise revenue cycle management . As a team, we are absolutely passionate about quality revenue management. It starts with this commitment. The Medical billing process is to move a claim through a desired path to payment, manage any exceptions which brings the claim back to the desired path and learn how to possibly avoid that exception going forward. The first step is to submit the well-structured superbill to the insurance company. Sounds straight forward, but it is not that easy. There are many more things to consider than humanly possible to remember. MDinTouch has developed a sophisticated Rules Engine that examines the draft superbill and considers thousands of rules against each and every superbill. The system then presents or applies the rules that match, based on a combination of the insurance plan, procedure and diagnosis codes. This Rules Engine is the first key to successful high quality claims that pay. After submitting the superbills, there are many different claims in several different stages at any given time. We have a software algorithm that triages these claims based on the likelihood that they need attention and present these claims to different eomployees for different types of follow-up. We also continuously scan all the claims, current and settled, to find patterns and potential issues. Now, we never rest on our laurels as there are feedback loops built into our processes. We continuously review the claim denial reasons, patterns and potential issues and continuously update and add rules in the Rules Engine, as well as evolve processes, or re-train staff. We are relentless in our quality pursuit. High quality improves cash flow, you get paid for what you do, and keeps the cost of medical billing low. In our Health of Practice sessions, we present your financial and operational performance and success factors. Not just full transparency, but an engaging collaborative review and discussion on what went well and what can be done to improve. We have a unique skill set that we bring to your compliance program as we are both Certified Professional Coder (CPC) and Certified Healthcare Documentation Specialist (CHDS). Our system selects encounters at random to be audited, correlating the codes and the clinical documentation, and identifying any omissions. Enjoy this introduction to our Medical Billing Services! FEEL GREAT ABOUT YOUR MEDICAL BILLING SERVICE! Our state-of-the-art software combined with professional, highly experienced staff is the perfect solution for your practice. Get paid accurately & timely for all your patient visits. Avoid providing service you are NOT getting paid for. Learn how to avoid future common denials. Be compliant by using the right codes with supporting documentation. Run a profitable business while maintaining high standards of patient care!